Feb. 1, 2019 – Given a number of potential risks we identified at the start of the week, everything seems to have broken right for the market over the last five days. This morning’s jobs report showed the economy adding jobs at a faster-than-expected pace and new workers coming in from the sidelines. Headlines from the trade talks between the U.S. and China were positive. There are still no specifics from these talks. In fact, U.S. Trade Representative Robert Lighthizer said the two sides were just beginning to start putting together a document. That shows that the two sides are pretty far apart. This doesn’t necessarily mean the two sides will have to work furiously to meet the March 1 deadline currently in place for new tariffs. Those duties are to be enacted under a national security provision, meaning President Trump can move the deadline, or just not enact the tariffs at any point. Second, Lighthizer said that a final deal would not be going to Congress for a vote. This means that the administration is not looking to sign an actual trade treaty, but could adopt a memorandum of understanding or something else. This seems like it lowers the stakes significantly, although it also lowers the chances of a deal that makes significant, lasting changes to the flow of trade between the two countries. The Federal Reserve meeting went as well as the market could have hoped. No one expected the central bank to raise rates, but in addition to a hold, we got a lot of reassurance about how the Fed will be “patient” before making additional moves to tighten monetary policy. The new workers joining the workforce mentioned above are very helpful to the Fed’s desire to be patient, as an increasing supply of labor helps keep wages, and thus inflation, from rising too quickly. Meanwhile, earnings seasons marches on. This week and next week are the peak in terms of volume of reports per day. 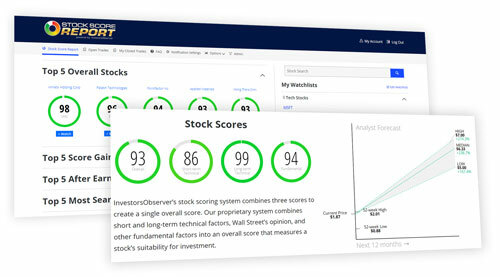 FactSet reports that as of today, 46% of the S&P 500 has reported and 70% of the reporters have beaten EPS estimates, while 62% have beaten revenue estimates. The earnings beat rate is somehow below the five-year average, while the revenue beat-rate is above the five-year average. The size of earnings beats is also a bit below the recent historical average, while the revenue beats are bit above the historical average. It’s hard to know exactly how to interpret this data in the aggregate (other than to wonder about a system where a 70% rate of upside surprises is somehow not as good as usual). Market reaction has been considerably more deliberate than we’ve seen in the recent past. It almost seems like the investment community is considering each report on the merits and trying not to extrapolate a decision about the health of the world economy based on each report. It is also possible that after panic selling for most of the fourth quarter, and then smashing the buy button from the last week of December into January, everyone is too tired to whip the market around each time a new set of numbers hits the news. In either case, this seems like a healthier situation, although with less market-wide correlation we seem to be in a market where individual stock selection can have a larger effect. All told this week, the S&P gained 2.6%, the Nadsaq rose 2.7%, and the Dow Jones added 2.4%. The story of the major indices is similar in almost every way. 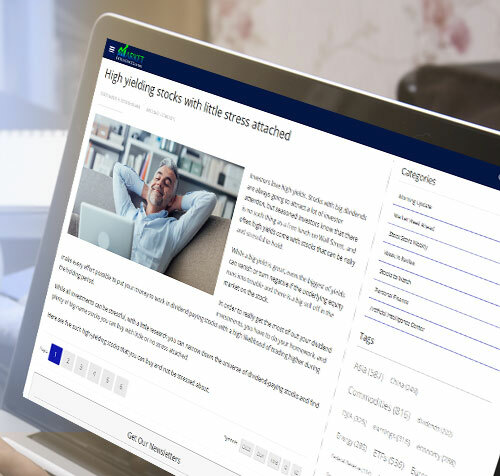 All the indices have performed extremely well since the Christmas holiday, with solid strength enabling them to rise through resistance, creating the support needed to continue higher after pullbacks. Each of the indices has pushed through their 8, 20, and 50-day moving averages, but are all under similar pressure from their 100-day moving averages. We will look at each index on a 1-year chart and 3-month chart. The 1-year chart will enable us to see why support (dotted lines) and resistance (solid lines) are placed at those levels, and the 3-month chart will let us see a clearer picture of where the indices truly stand. The S&P’s 8-day moving average (red line) has served as a great level of support, with the index rebounding almost every time it encountered it. 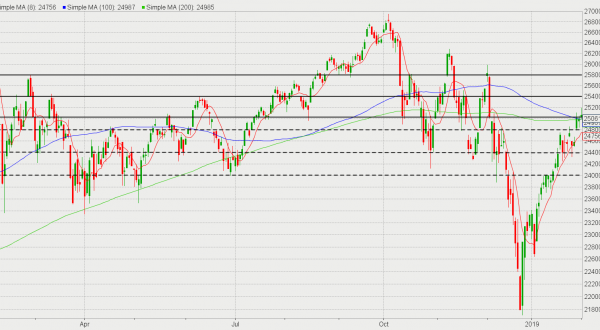 The times the S&P fell below the 8-day, it was saved by support around 2,620. 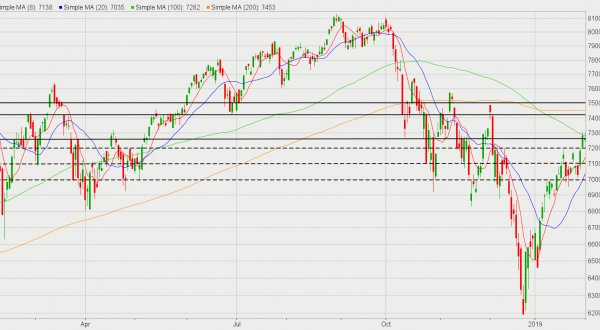 In almost every case where the 8-day intersected with support/resistance levels, it gave the S&P a substantial boost. The S&P was able to break through resistance at 2,700, but immediately stalled when encountering its 100-day moving average (blue line). Hopefully, the 2,700 level that has now become support will give the index the strength needed to push through the 100-day. If the S&P can push through, the more ominous picture is the 200-day moving average (green line) converging with resistance at 2,740. Should the S&P fall from its current level, it has gained enough support levels to have a decent chance of rebounding quickly. 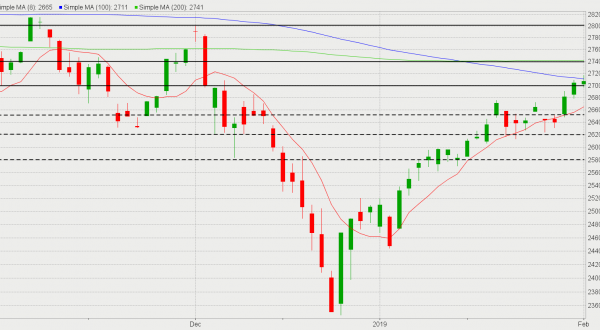 The Nasdaq has tested the 7,200 level of resistance a couple of times in recent weeks, but the 8-day moving average (red line) came through for support. 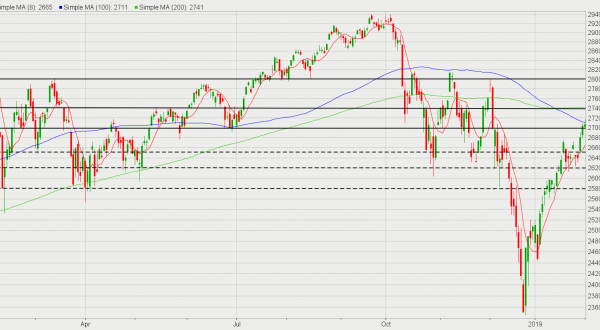 The Nasdaq turned the 7,200 level into support this week, which will likely help to push the index higher. 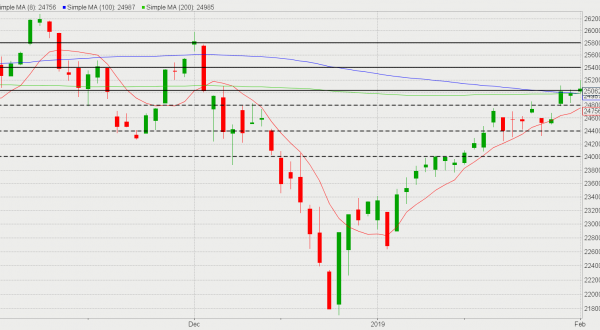 The Nasdaq looked as if it would turn resistance around 7,250 into support but was stopped in its tracks by the 100-day moving average (green line). 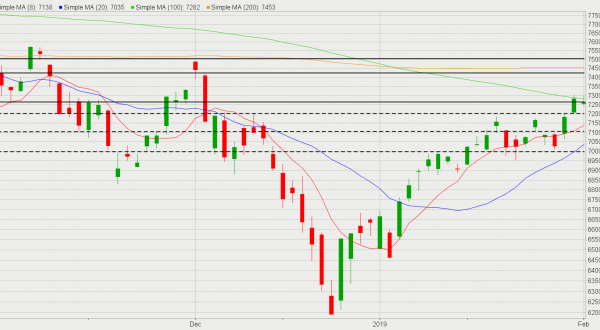 If the Nasdaq can break through here, it has a reasonable amount of room to run before encountering strong resistance at 7,425 and the dreaded 200-day moving average (yellow line). Hopefully for the Dow, the 8-day moving average (red line), which has been great support for the index, can continue to push the Dow higher as it converges with support at 24,800. The Dow is the index under the heaviest pressure as its 100-day (blue line) and 200-day (green line) moving averages are both converging near resistance at 25,000. 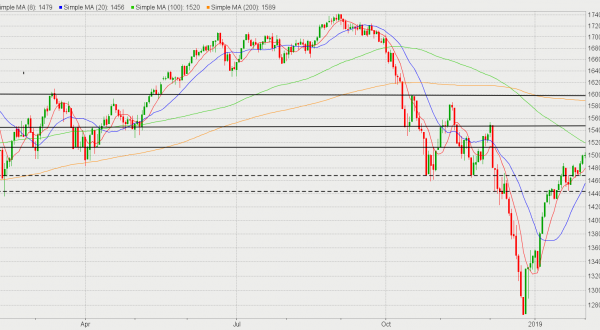 The Dow will need all the strength and support it can get, as the 25,000 will be a big barrier for the index to overcome. The Russell only has a couple of strong levels of technical support but does have support in its 8-day (red line) and 20-day (blue line) moving averages. Since the index performed so poorly in recent months, it is just starting to encounter the heavier levels of technical resistance that other indices have already been dealing with for the past couple of weeks. 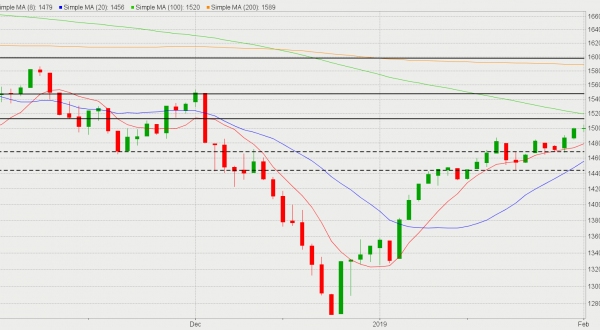 If the Russell can break through the resistance just below 1,520, where the 100-day moving average (green line) is closing in, it may have a difficult time as resistance becomes thick between its current price and 1,600.